I’ve had the pleasure of visiting Guatemala three times, the first time was in 2005, the second time was in 2006, and the third time was in 2015, and it was the one thing I’m passionate about which drew me to Guatemala, volcanoes. Now Guatemala has a bunch of fascinating volcanoes but what we know about is that just 3 of them are active, they are Santiaguito, Fuego, and Pacaya. However, there is another volcano which often catches my eye and it’s not even active, it is Volcan Agua. What fascinates me the most about Agua is the near perfect conical shape dominating the landscape near the colonial town of Antigua (or Antigua Guatemala). Go up to Cerro de la Cruz which lies to the north of town and you’ll get a majestic view of that stratovolcano rising above Antigua and the surrounding area. I made two attempts to climb Volcan Agua and on both occasions I failed to reach the top. The first attempt came in November 2005 when we made it as far as third of the way up but had to abort in the end as the locals coming down told us it was raining up there, two even warned us that there were thieves with machetes about. The second attempt came in December 2006 but this time at least I made it further, I made it as far as the upper slopes where the vegetation becomes grassland but the reason for aborting the climb was that we ran out of time and needed the light to descend. I was later told that I was just an hour away from reaching the summit crater area. Volcan Agua rises above the town of Antigua and the surrounding valley. IMAGE: René Goad. No historical eruptions have been known on Volcan Agua but it’s still an impressive cone dominating the surrounding landscape along with the twin volcanoes Acatenango and Fuego, it rises to 3760m asl. The settlements of Antigua and Ciudad Vieja lie to the north of the volcano, San Miguel Duenas lies to the northwest, Alotenango lies to the west-northwest, Palin lies to the southeast, and Santa Maria de Jesus (which lies at the foot of the volcano) lies to the northeast. 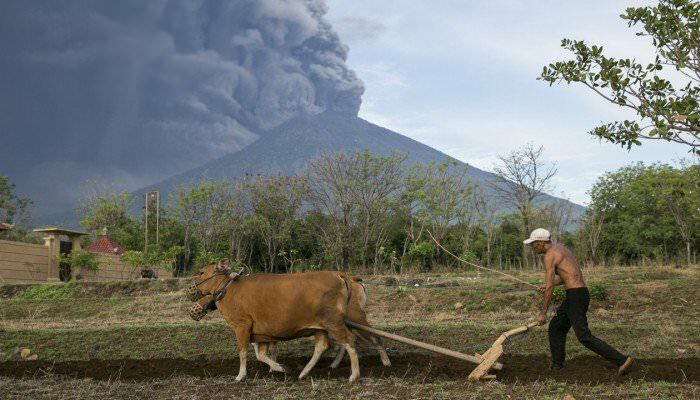 The northern half of the volcano is used for farming on the lower flanks especially for crops. Volcan Agua is also known as “Hunahpu” in the local Kaqchikel Mayan language. The summit crater rim is mostly breached to the north-northwest, and a slight collapse scarp is visible on the upper flanks on the north face of the volcano. One disaster did occur on Volcan Agua during 11th September 1541, although it wasn’t volcanic in origin. A huge mudflow came down the flank following a period of heavy rains and destroyed the old capital of Guatemala, Ciudad Vieja. Over 600 people were killed. The capital was later moved to what was to become Antigua Guatemala. It was suggested that Volcan Agua once contained a crater lake at the summit and that a part of the crater rim had ruptured causing a huge flow of water to come down the flanks. However, a scientific paper by USGS suggested that it was more likely to have been caused by a slope failure similar to the event of 30th October 1998 in Nicaragua when a slope failure on the south flank of Volcan Casita caused a debris avalanche killing between 1,560 and 1,680 people and destroyed towns and settlements on the way. I’ve been struggling to find information on the prehistoric eruptions of Volcan Agua so evidence of volcanic activity is limited. The symmetrical cone of Agua suggests that it is of a relatively young age. It is understood that there are six small pit craters on the northwest flank, I’m guessing that this must indicate failed flank eruptions. However, a couple of small cones are present on the south flank of the volcano which indicate successful flank eruptions did take place in the past. Numerous explosive eruptions did occur on Agua in the past 80,000 years, the most recent occurred over 10,000 years ago. Ash deposits from Volcan Agua are present as part of the Los Chocoyos ash deposits located to the south of Guatemala City. If you are climbing the volcano then you will see that after the halfway point there is a gorge one has to descend into in order to get up on to the other side, and in that gorge grey deposits are exposed suggesting that pyroclastic flows used to occur often. I personally passed through this gorge myself during my hike up back in 2006. Exposed pyroclastic deposits on the upper middle flank of Volcan Agua. IMAGE: René Goad. The twin volcanoes of Acatenango and Fuego lie directly opposite Volcan Agua, they both erupted during historical times. As we know, Volcan Fuego is frequently active and always has been since the Spaniards first colonised the land which is now today’s Guatemala. Volcan Acatenango on the other hand, has only produced three historical eruptions in 1924-25, 1926-27, and 1972. The construction of the twin peaks of Acatenango dated back to 85,000 years ago whereas Volcan Fuego was constructed over an older edifice, Meseta. The construction of Meseta dates back 230,000 years ago before it collapsed some time ago. It could be that the triple volcanoes of Agua, Acatenango, and Fuego were in a period of high activity at the time and may have gone through activity shifting between volcanoes or erupting simultaneously. Based on it’s Andesitic to Basaltic-Andesite conical profile, if Volcan Agua were to be erupting again then the activity most likely would consist of minor to moderate explosions of strombolian or vulcanian style with the odd pyroclastic flows. In a scenario where a large eruption would take place pyroclastic flows could occur, and the urban areas especially around the base of the north face of the volcano would be at risk as well as the inhabitants. The village of Santa Maria de Jesus which is located up the hill from Antigua to the south lies the closest to Volcan Agua. Many crops would be destroyed too. Not only would there be a risk of eruptive activity, there would be a risk of lahars to follow too. Whilst there’s a lack of reports of lahar activity on Volcan Agua, it is understood that Agua is prone to lahar activity. Volcan Agua as it appears from the village of Santa Maria de Jesus. IMAGE: René Goad. 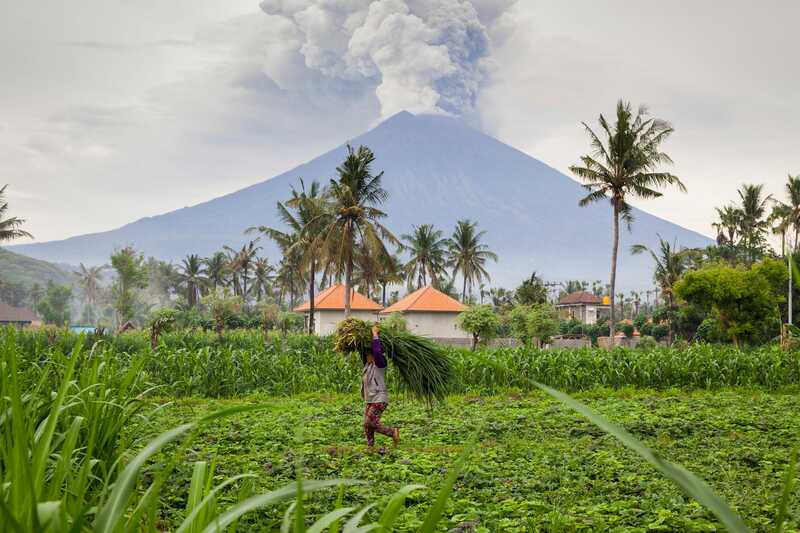 Volcan Agua has shown to be capable of explosive eruptions which produce pyroclastic flows based on the evidence which is available, and even a parasitic vent eruption. However, it has not been known to display an ounce of volcanic activity during historical times, not even fumarolic activity. It has been known before for volcanoes to reawaken after centuries of inactivity but I believe it’s highly unlikely that Volcan Agua will erupt in the short term and even if some activity does get detected, then INSIVUMEH and CONRED will be on it like greyhounds. So I don’t want to sound alarmist. Lahar Hazards at Agua Volcano, Guatemala – S. P. Schilling, J. W. Vallance, O. Matias, and M.M. Howell. If there would be a catastrophic eruption of Volcan Agua then perhaps Antigua could be the Central American Pompeii? Dunno about that, from what I understand, some pretty deviant stuff was going on there… but thats from a different viewpoint. To them, it was business as normal. Yet another magnificent article, wonderfully writtent, and as usual teaching us a lot about everything volcanic…. This volcano is very likely not to have basaltic andesite magma chambers anymore. What’s in it must have fractionated to hell, and it’s very likely to be converted into rhyolite crystal mush which isn’t eruptible anymore. Shall a shift in energy happen, I would expect the fresh basaltic magma to remelt the crystal mush, mix somewhat with it and send it flying upwards…. That’s the how-to for those big-blasts-after-eons-of-dormancy, think Chaiten to quote a medium-sized event (quite powerful by itself in fact)…. I’m not saying Agua would go Tambora or Krakatoa, just to remind cycle-opening eruptions on subduction volcanoes can be quite unexpectedly powerful for this exact reason. Once purged of the old stuff simmering away in its innards, provided the composition of the feeder magma hasn’t changed (and the cone hasn’t gone away) it should be back to its old Strombolian habits. Food for thought, from somebody who knows a bit but is far from any level of expertise. Agua contains minor amounts of Dacite but I don’t know about Rhyolite. Good point though. Not much action at the seismogram, but a bit of a plume in the Indonesian morning. Agung. It is not a confirmation: it is a suggestion. It may well be correct, but if so, Bardarbunga may currently also be erupting as it shows similar levels of activity. Well, that short pop of BEZYMIANNY comes in at 2.2300195 x 109 DRE. At a 12 km altitude, it likely made it above the tropopause that averages around 10 km height at that Latitude. Any SO2 that it lofted should be sulfate by February. That it was a single main blast is good, that cuts back on how much SO2 it could have lofted. Hopefully Agung doesn’t follow suit. What I do not know is what mass fraction of the plume is made up of sulfur based chemicals. Anyone having a good version of the TiO2/FeO ratio to sulfur content please point at the applicable paper, and if any one has access to the typical geochemistry of BEZYMIANNY ash also point at that if you have it please. Not that I can really do anything with the data, but it would be nice to have and idea of how much sulfur we’re talking about here. My opinon is that Indonesian volcanoes are sulfur rich, but Kamchatkan volcanoes are also fed by a subducting oceanic plate, so they may be similar. It went WAY higher than 12 km… That was our volcanic event of the year….. In a nutshell: first explosion, moderate, 8 km high, then it went big, big time!!! The images speak for themselves…. holy bleeping bleep……. Based on the looks of the next video, ther might have been an even bigger third explosion. This is just….well…. wow. Now it’s just *evident* why Bezymianny is Russian Mount St-Helens…..
That thing *smashed* through the tropopause, look closely at it, you can see a fringe of clouds which marks where it’s at..
That is really impressive. Any idea what it’s done since then? It’s calmed down for now. We’ll have to wait to see if the explosion did any damage to the lava dome. That pop was roughly the equivalent of 13.06 Megaton blast. If the dome survived, it will be pretty amazing. Out of curiosity, how big would the tsar bomba be if it was a volcanic eruption? Im guessing a very big VEI 5, up to a solid 6. Hard to call. running through the energy release of Agung during it’s initial stages in November it outpaced Tsar Bomba quite easily with it’s total energy release. Keep in mind that this was using the plume height as an indicator of energy being dissipated by tallying up the equiv yield of a plume of the same height. A workable, but dodgy way of doing it. Since VEI is actually a measure of how much material was lofted, Tsar Bomba is going to be much smaller than one would assume. It was after all, an air burst. Had it been a surface or subsurface shot, it’s VEI would have been nasty. I think the thing I actually meant was intensity. As in how big would an eruption have to be to reach the intensity of a 50 megaton hydrogen bomb. I found a table on wikipedia that says the tsar bomba was equivalent to a magnitude 8.2 earthquake. A magnitude 9 earthquake is roughly equivalent to a VEI 8 eruption so I guess the tsar bomba is smaller than a VEI 8 but I dont know from there. But as you said VEI is about volume then this might be a pointless measurement. On a side note, if a magnitude 9 earthquake is equivalent to a VEI 8 eruption – then the 2004 boxing day earthquake was about the same energy release as toba. It also means earthquakes release much more energy than volcanoes to. I am only 18 and several earthquakes around magnitude 9 have happened, including the second biggest ever in recorded history. The biggest eruption by volume within my life was probably holuhraun which would only be a VEI 5 if it was ash. If volcanoes and earthquakes were energy equivalent there would be a lot more yellowstones to worry about with a much higher risk. If 18, then you missed Pinatubo. About the only thing I saw from Pinatubo were some excited news freaks salivating on TV. The same for St Helens. Others here had to actually deal with St Helens, but all I was worried about was not freezing my arse off in bootcamp. THAT was a rude awakening. Raised in Mississppi my whole life, winding up in RTC Great Lakes for winter was a shock. Yeah, the issued “horse blankets” reeked of moth-balls, but at least they were made of wool. Note: I call them “Horse Blankets” because in my limited experience, that was what they resembled. I have since found out that wool cloth allegedly does not loose it’s insulating characteristics when damp. Another plus for sheep. Yay Sheep! Those olive drab monstrosities could at least keep you warm… unless a foot or hand slips out from under it. What really got my attention was the 2″ of ice on the inside of the windows that accumulated from a barracks full of people breathing. And yes, I did slip and bust my arse while marching to chow and took out half of the formation when I fell. At least the push-ups warmed me up a bit. And to think, the day before I went to RTC Great Lakes I had been hunting in hot and humid soybean field. Probably about 100°F heat index. We were taking turns being the dog. As soon as the birds flushed, you dove to the ground so that your partner could get off a shot. Yeah, we were a bit crazy… if not outright stupid. My 12km number is for the height above the edifice. In order to get the formula to work, I have to back out the size of the mountain. I appreciate the notation of where the tropopause “appears” to be at in the video, but it is not that simple, the actual tropopause is where the lapse rate is inverted. With increasing altitude, instead of getting colder, it gets warmer. The method of actually determining where that is via sensors and not directly measuring it has been a topic of conjecture with a few papers generated about it. In general, it is pretty much the absolute top of a well developed thunderstorm with massive convection. What I used was just an estimate based on seasonal averages and latitude from the Giovanni portal, but it’s been so long since I pulled that data-set, that I can’t remember where on that site I got it from. If any hobbyists or science students are looking for a really good source of satellite derived data, it is probably the best site for raw data you can find. They are fairly open to use of the data, as long as you properly cite it’s use. Personally, I think this is one of the better publicity things Nasa has done. Finally had time today to get online and was delighted to see on the MILA cams they now have one on Oraefajokull. It’s currently to dark to see anything, but I will definitely check it out later in the day. Stromboli is giving a little show. Looks pretty at night. Do we have a definitive answer as to what causes the big tremor like signal at agung? Its doing its thing again as we speak. Lahar seems the most likely candidate based on evidence so far. This one seems to have built up over 30 mins or so , which would be fairly consistent, I believe. It is unlikely to be related to human activity at this time of night. I agree, there were some pictures on Twitter that really brought the whole thing down to earth, it was great to see, but scary. 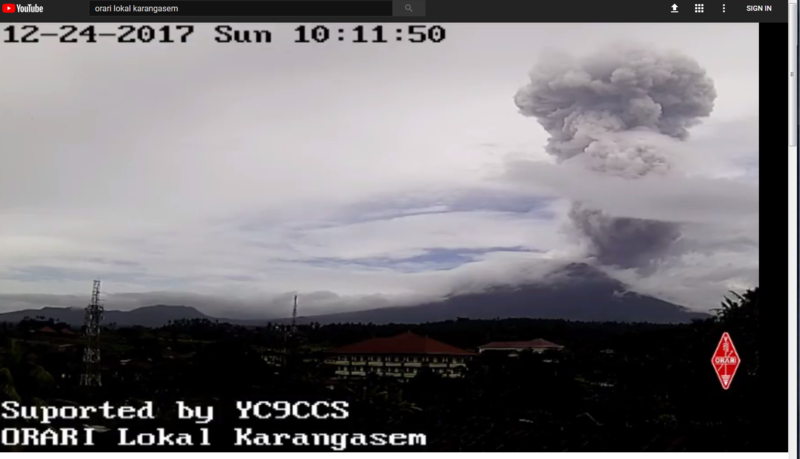 Activity Plume at the moment Agung. The smaller vent can clearly be seen now. If so, that might be why agua isnt erupting, as pacaya and fuego are on either side of it and take all the available magma. If pacaya and fuego are younger than agua this might be another related factor. Agua erupts first, then fuego and pacaya, which take over the magma supply which leaves agua technically extinct (although if it is fed from the calderas magma chamber it technically isnt its own volcano anyway and its erupting right now in effect). It also would be another example of a currently erupting supervolcano that is actually having a double eruption. This might be a question for Carl, with his knowledge on these very volcanoes. ( I have head the older post on this by the way, but the question I am asking was not conclusively answered in that post). I don’t know a lot about the Amatitlan caldera but it’s a good point. Carl would probably know the answer, or at least know more than anyone else here seeing as he has spent a lot of time there. But I suspect he is busy writing the next part of the updated woolly mammoth guide to Iceland volcanoes. Real-time surveillance around Öræfajökull has been improved in the last month to better monitor the seismicity (significantly increased since September this year) and the release of geothermal water from the caldera (detected the first time in mid-November). New seismometers, hydrological stations, web-cams and GPS have been installed in the area and data are now streaming to the Icelandic Meteorological Office which is in charge of the 24/7 monitoring service. The recent seismicity has been showing a level comparable to the previous week. In December most of the earthquakes have had magnitudes smaller than M1 and the largest earthquake recorded so far had M2.5. Most of the seismicity is located close to the caldera and at a depth between 2-10 km (the depth has a fairly large uncertainty). Estimates of the geothermal power beneath the volcano, as assessed by the temporal changes on the ice-surface are not suggesting an increase. There are no clear indications that water is accumulating beneath the ice in the cauldron and, given the trend of the activity until now, it is unlikely to expect a flood in the next months. However, it is very important to keep following this process with regular measurements of the caldera and the ice-surface deformation. Geochemical analysis of air samples collected at Kvíá river have not been conclusive to identify the gas species diffusing in the area. Smells of gas in the area was quite strong until the last week but it seems less intense in the last days. The atmospheric sounding for BEZYMIANNY indicates the tropopause is currently rather low at around 26,000′ or 8km……so some ejecta likely make it into the Junge layer. We can only hope that some aerosol-induced local cooling might result over the Bering sea and help redevelop the arctic sea-ice? North American dipole (warm ridging in the west, cold troughing in the east). As a result here on the west coast, we are once again into unprecedented bone-dry drought conditions… especially in Southern California where no rain has fallen in many places since last Spring, along with the state’s second largest fire in history (Thomas fire) occurring in December…normally the 2nd-3rd rainiest month of the year. On the face of it, Agung is becoming slightly calmer over these last few days. The seismogram is showing fewer and smaller events. I believe that someone posted that it was showing deflation? I’m interested to know what people think of this latest phase. Is it becoming more solidly blocked up? Definitely calming down. But not dead, The seismographs showed a big explosion after 22:20 (local time) and a big rumble around 17:45 which I wonder may have been a land slide. It was just before the lahar. But the number of visible earthquakes has halved. Careful. You might get a response from a moon-bat like me. I tend to look for the bad in the good. To me, it’s chambering another round. Fortunately, my opinion doesn’t really mean much since I have no firm basis or evidence this is what is going on. And I reiterate, if some reporter comes along and uses my opinion as the basis for an alarmist article, they are a full on vapid idiot not worth the salary they are being paid. I’m just some random dude on the Internet with no formal training in volcanology. You want a projection or prediction? Go find someone that does volcanology at the professional level. One thing that I can say with some measure of certainty, volcanoes do NOT follow schedules. Sure, you can describe their activity on the long term with statistics, but when it comes down to a singular event, you get a lot of purely random variables and events that determine what actually happens. Such as; Magma influx rate into the system. Sheer strength of the rock, the mass of the edifice and how it affects the confining pressure at the depth the liquid magma is at, magma chamber pressure, strata weaknesses that are a function of composition and how the strata was placed when it formed. The list is quite long. Mathematically, you can develop a model of the system, but any part of the system that has to be guessed at or assumed, introduces a large measure of uncertainty. The portions of the model that have to be assumed are simplifications that are done just to get the thing to yield a result. Ideally, you would have a model where everything is known about how all the variables interact, but invariably you are just deluding yourself because when you think you have the answer, the modeled system will just do something else. The Murphy’s law aspect of it is one reason that I have no issue with following behind a transport truck on a dimly lit 2 lane highway near sunset. There is always a risk of something jumping out of the woods or some on coming car crossing the center line. With an 80,000 pound trailer and truck between me and it, I have the comfort of knowing that whatever the thing is, it has to get through that truck to get to me. That’s right, I’m the jerk who won’t pass the truck. Live with it. Alternate idea and much more likely than my “Shhh! reloading” thought. It could just be running out of dissolved gasses. When the gas content of the magma gets low enough, it will quit ex-solving. Most of what we have been seeing is gas driven, so it would make sense that with less gas, you have less activity. Being mainly gas driven would also account for there not being liquid magma over-topping the crater wall like in 1963. I’m sort of a heretic moon-bat. I’m just as easily able to adopt an idea that disproves my catastrophe musings. Following up on your rumination, assuming gaseous de-pressurization is taking place, shouldn't that make the magma below less viscous? If so, then perhaps magma is more efficiently (and silently) propagating throughout the upper-chamber-to-surface pathway(s). A wider distribution of magma at shallow depth in turn would make the overhanging rock more ductile…which may also partially explain the reduction in seismicity? I don’t know how disolved gases affect the viscosity. But since much of what we see as ash columns appears to be gas driven, it fits that less gas means lower energy plumes… and fewer of them. The root of my thinking is what possible stiction changes in the magma might be expected from the reduction in overall pressure that the magma is under, plus what changes on the fluid’s (magma) chemical composition occurs from the release of trapped volatiles, and could these chemical changes affect the magma’s viscosity? ie. Does the magma become sticker and more viscous, or does it flow easier with less viscosity as trapped gases are released and the external pressure is reduced? If we look at the Earth’s core, what is essentially magmatic material (i.e. the mantel) is compressed to a solid state due to extreme gravitational pressure. Then, as you move away from the core, the magma/mantle becomes progressively more ductile as gravitational pressure becomes less and less. I was thinking that maybe by lowering pressure, magma would continue to progress to a more pure liquid state i.e. leading to a change in viscosity perhaps? But, you answered my question, so it’s back to the ol’ drawing board. Much appreciated that you took the time to answer. That’s assuming the crater looked the same pre-1963 as pre-2017–that is, hypothetically the volume of lava was/is roughly the same but the topography is different. Does anyone know a convenient way of analyzing Icelandic earthquakes by depth over time? I’m interested in asking, and answering, such questions as ‘what has been the trend in deep (say over 12km) quakes over the last year? The last ten years? There is not much of a trend at all, in any direction. The issue with plotting depth over time is the data is skewed by changes in equipment which pushes the data around unnaturally. Also, what is “Iceland” ? The boundaries have a significant impact on depth. Two greens with a swarm in southern Iceland. Tectonic? Spreading event? Could it be that Agua, Acatenango, and Fuego have a connection with the Amatitlan caldera? Interesting question. The distance between them gives a clue. To share a magma chamber, a rough idea is that the depth should be of order twice the separation. So a shared magma chamber would need to be 20 kilometer or more down. Shallower chambers will be individual (though conceivably still fed from a common storage at depth). For a stratovolcano, the magma needs to be able to travel to the top, several kilometers high. Magma will always take the path of least resistance, so it will prefer to use an exit on the flank, where it doesn’t have to rise so much against the weight of the mountain. This tells you that the (shallow) magma chamber will typically be underneath the centre of the mountain. It also means that once the central conduit is gone, it is difficult to re-establish it. It may be come easier for the magma to build a new stratovolcano nearby. For Agua, the mountain looks young (in shape ) and old (fully vegetated, unlike the other volcanoes nearby). So it still erupts but not often. Agung is playing up. In 1963, the activity died down and the lava dried up. This stopped the gas from coming out and once the conduit was blocked, pressure build up. This caused the major explosion. This year’s event is much smaller but the same sequence is playing out. There have been three significant quakes in the past day, larger than previous days. The most recent one was at 17:30 (local time). I don’t know whether there was an ash cloud, and in fact I have no idea what kind of event it was. But It is now the same amount of time since the first explosion as it took in 1963, and I would guess the same process is acting. Gas pressure is increasing. If it can find a way to leak out, no problem. If not, a larger explosion (not at the level of 1963 though) is a possibility. The 17.30 local time was the 9.27 utc M 4.6 – 52km NW of Kampungbajo, Indonesia, likely. Does increasing pressure always (immediately) show in gps data? The increased pressure will cause a displacement, but whether the GPS stations pick it up depends on how often the station data is retrieved and updated. As far as I know, there is no effective delay in how fast the pressure effects propagate through rock, other that the inherent p wave speed. Intriguing how the gps s are moving away from Agung at the moment. Maybe there is a slow refill of a shallow chamber …. Exciting period ahead. There was a very nice ash cloud at noon. Quite pretty. I love this site too! Keep up the great scientific work, y’all, and Happy Holidays! I don’t know how to upload a screenshot? Can I email it to a moderator? This website does not have HTML tools. Assuming you are on a PC, right click your image once posted imgur (apparently you don’t need to sign up) and select “copy image location” then paste into the text box here. I think that’s what I did…. Nice contrast with the cows and the volcano. 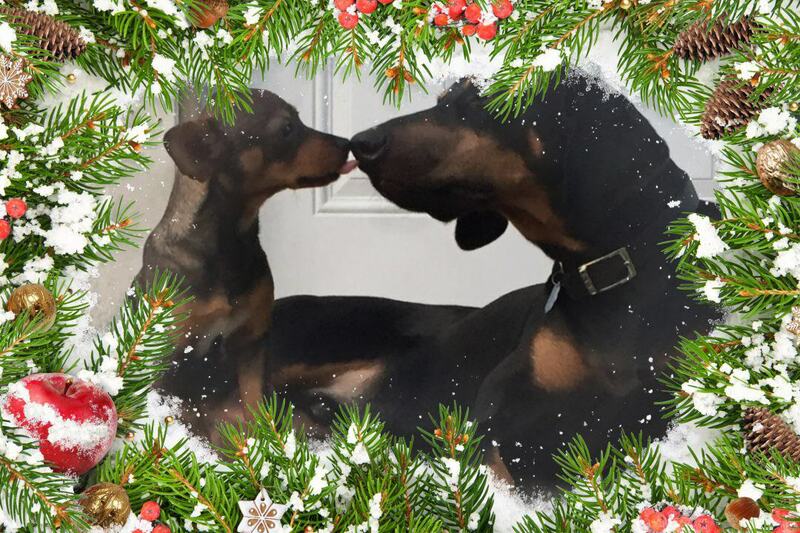 Merry Christmas, Happy New Year and all that.